We have this sterling silver Manta Ray necklace and sterling silver Stingray necklace collection because Mantas and Stingrays are our favorite rays. Manta Rays are graceful, magnificent giants and their appeal is obvious to those who have seen them, especially up close. Stingrays are very common in our coastal waters and end up on the ends of fishing lines quite often - unintentionally. And I've got to tell you, they taste great smothered in sambal (a chili based sauce). 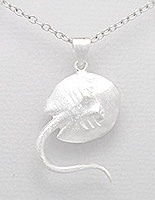 Get the sterling silver Manta Ray necklace or sterling silver Stingray necklace that is just right for you by buying your favorite Ray pendant and a matching chain. We've helped you with obtaining the right match by preselecting a special range of 925 sterling silver chains that best match our premium quality sterling silver Ray pendants and furthermore, try on all the chains with each pendant to identify the best looking combination. 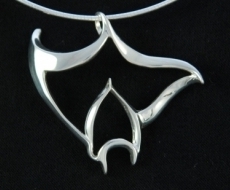 However, you may have your own preference or you may be looking for a sterling silver Manta Ray necklace / sterling silver Stingray necklace for men or one for women and would prefer a chain that is more masculine or feminine. You have the option of accepting our recommendations or match pendants and chains yourself. 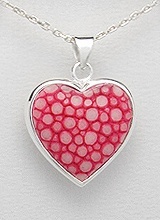 Enjoy a 15% discount off the chain price when you buy a pendant in the same order to make up a sterling silver necklace. 1. Purchase a Ray pendant by clicking its 'Add to Cart' button. 2. Click on the recommended chain's image and you'll find yourself at the sterling silver chain page. Add the chain to your order (click the lower 'Add to Cart' button). You can pick any other chain if you wish. The 15% discount applies just the same. The height measurement of these sterling silver ray pendants does not include the bail. sterling silver snake chain, the flow of the fluid lines on the pendant get to be accentuated instead as snake chains connote fluidity and this makes the sterling silver Manta Ray necklace looks even more lively. The Snake Chain and Rope Chain above are also the matching chains for another huge Manta immediately below - DP 1110. Besides USD (United States Dollars), you can buy in $ AUD, £ GBP, $ CAD, CZK, DKK, € EUR, $ HKD, HUF, ILS, ¥ JPY, $ MXN, $ NZD, NOK, P PHP, $ SGD, PLN, RUB, SEK, CHF, NT$ TWD and ฿ THB. Click Payment in Non US Dollar Currencies for details. 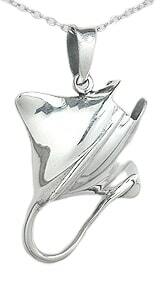 This sterling silver Manta Ray isn't very big and that's the only compromise - size. Everything else about it is wonderful. You may even want to display its underside now and then. The other side looks great too. sterling silver Box Chain, the elegance and beauty of quality silver jewelry runs from the marvellous Ray to all around your neck. The necklace in gold on the right is not available for purchase. It is shown here for a clearer view of the design. sterling silver Box Chain. What do you think? Good match? Both chains matches either Manta. As the pendant is small, a slim chain is best. Even better if it comes in a simple design that does not take attention away from the unique Aboriginal art motif. 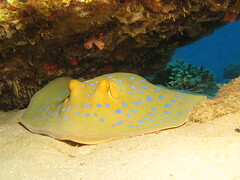 The Blue Spotted Stingray sure is! With those striking blue spots. How do you find the spots on this sterling silver Spotted Stingray necklace? They are Abalone Shell pieces. There is so much to admire on this captivating, life-like Spotted Stingray, you'll want the chain to be simple in design. 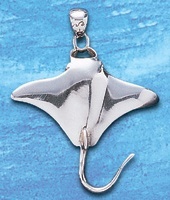 Are you concerned your manta ray or stingray jewelry gifts will not be appreciated? We have created ‘Gift Enhancers’ like Rays of Love to turn your ray jewelry into perfect gifts. Click here to learn more and gain access! This Stingray comes with much meat... I mean shiny polished silver in the central and main area and details are predominantly on the peripheral regions. 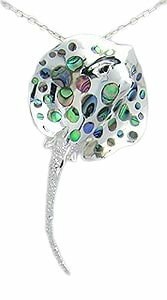 Works well as a women's sterling silver Stingray necklace and as a men's sterling silver Stingray necklace, I'll say. The stingray is the exact same design as DP 510 (above) except it is inlaid with Paua Shell and the matching chain is the same recommended sterling silver Box Chain shown above. This Stingray piece goes with Cable chains well. We have 2 options. sterling silver Cable Chain A, a much thinner version of sterling silver Cable Chain B. This works better if you don't have something against thin chains. We are currently having a 1 cent jewelry promotion! This Stingray on the other hand comes with details all over its body. I guess you'll have to hold it up close to appreciate that. A plainer chain is more suitable in this case as the details are in silver and the subdued contrasts can be better appreciated if the chain does not distract the eye from the pendant. 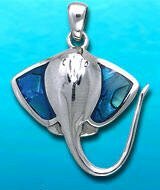 Take note that although the pendant is not big, much silver is used and the pendant is quite substantial. 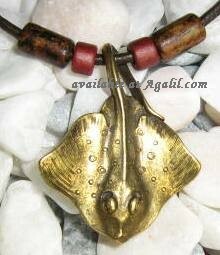 This Stingray necklace design is also available as a Brass Plated Stingray Necklace and as a Pewter Stingray Necklace. Click the link or photograph for more information. Perhaps with this photograph you can see more of the details I'm talking about. to order the it on the chain page. 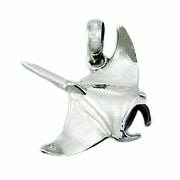 If you would like more information on the Ray pendants, click Manta Ray Pendant / Stingray Pendant to visit the dedicated pendant page. Experience the underwater world anew! Just fill out the simple form above to begin enjoying the very unusual membership benefits that are new, different and unheard of! Pin jewelry you like. Like this page on Facebook. Copyright © Agalil.com, All Rights Reserved.